I am really proud of my daughter Heather Powers of Humblebeads. 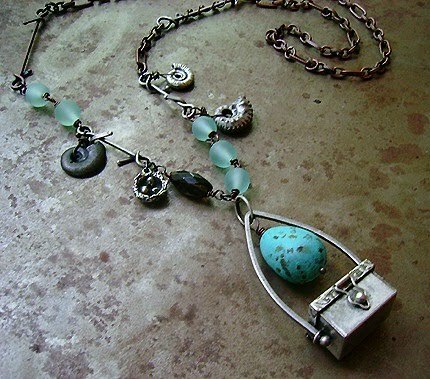 She created this wonderful necklace and entered it in the Industrial Chic Reader's Challenge. I would love to see her win this contest. Voting is open until Monday July 26th. Inspired by the themes of delicate and precious thing stored away in a keepsake box, I incorporated one of my hand painted polymer egg beads into the focal. I used the small nautilus shell spacers from the Industrial Chic line and a nest from Green Girl Studios for the dangles, attaching them to Industrial Chic twisted links. For color, I added sea-glass colored resin beads and a faceted smoky quartz bead. I completed the necklace with a generous length of Industrial Chic copper chain. 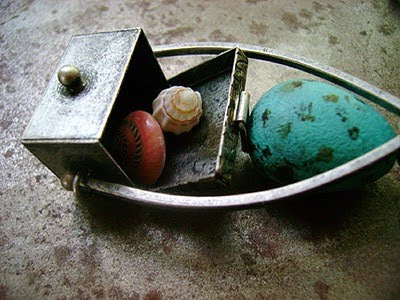 And to personalize the piece I replaced the tiny dice inside the treasure box with seashells from one of my trips to Mexico. Wonderful necklace! Good luck in the contest! I didn't know Heather was your daughter. She is such a talented lady, you must be so proud. This is a beautiful piece. I hope she wins!